His group famously protested at funerals for soldiers who died in Iraq and Afghanistan, including one in Portland in 2007. 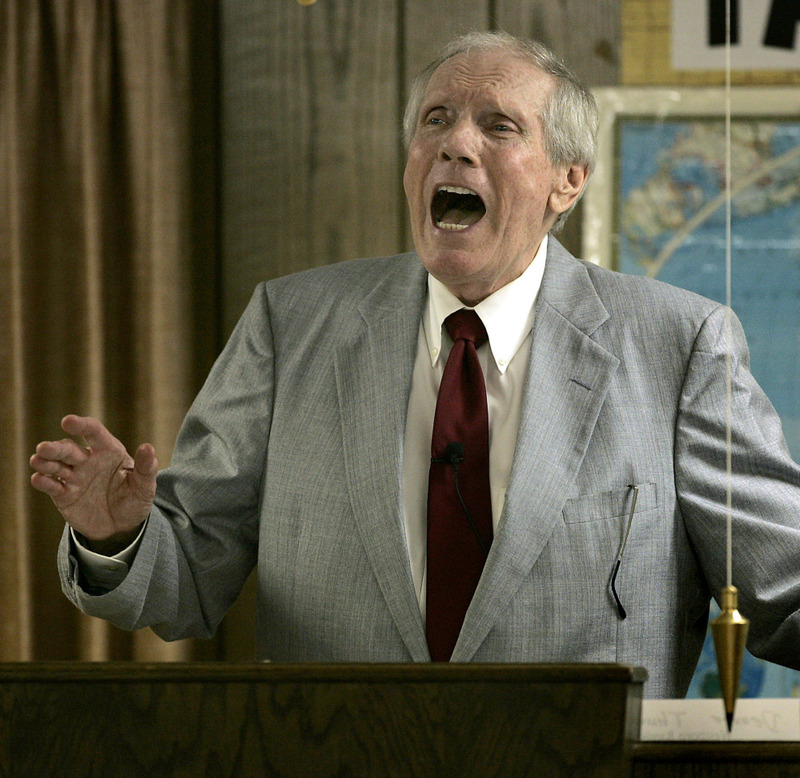 TOPEKA, Kan. — Fred Phelps did not care what you thought of his Westboro Baptist Church, nor did he care if you heard its message that society’s tolerance for gay people is the root of all earthly evil. By the time you saw one of his outrageous and hate-filled signs — “You’re Going to Hell” was among the more benign — you were already doomed. Tall, thin and increasingly spectral as he aged, the Rev. Fred Phelps Sr. and the Westboro Baptist Church, a small congregation made up almost entirely of his extended family, tested the boundaries of the free speech guarantees by violating accepted societal standards for decency in their unapologetic assault on gays and lesbians. In the process, some believe he even helped the cause of gay rights by serving as such a provocative symbol of intolerance. All of that was irrelevant to Phelps, who died late Wednesday. He was 84. God is love? Heresy, he preached, and derisively insisted the Lord had nothing but anger and bile for the moral miscreants of his creation. In Phelps’ reading of the Bible, God determined your fate at the moment of your creation. Informing the damned could not save them from eternal fire, Phelps believed, but it was required for his salvation and path to paradise. And so he and his flock traveled the country, protesting at the funerals for victims of AIDS and soldiers slain in Iraq and Afghanistan, picketing outside country music concerts and even the Academy Awards — any place sure to draw attention and a crowd — with an unrelenting message of hatred for gays and lesbians. The group protested in Portland in 2007 at the funeral for a soldier who had died in Iraq. It indicated that it would come to Maine several other times but didn’t show up. For those who didn’t like the message or the tactics, Phelps and his family had only disdain. “They need to drink a frosty mug of shut-the-hell-up and avert their eyes,” his daughter, Shirley Phelps-Roper, once told a group of Kansas lawmakers. The activities of Phelps’ church, unaffiliated with any larger denomination, inspired a federal law and laws in more than 40 states limiting protests and picketing at funerals. He and a daughter were even barred from entering Britain for inciting hatred. But in a major free-speech ruling in 2011, the U.S. Supreme Court held that the church and its members were protected by the U.S. Constitution’s First Amendment and could not be sued for monetary damages for inflicting pain on grieving families. Yet despite that legal victory, some gay rights advocates believe all the attention Phelps generated served to advance their cause. Sue Hyde, a staff member at the National Gay and Lesbian Task Force, said plenty of churches and ministers preach a message that attacks gay people. But Phelps and his family had “taken this out on the streets,” forcing people to confront their own views and rousing a protective instinct in parents and friends of gays and lesbians. Once seen as the church’s unchallengeable patriarch, Phelps’ public visibility waned as he grew older and less active in the church’s pickets, with daughters Shirley Phelps-Roper and Margie Phelps — an attorney who argued the church’s case before the U.S. Supreme Court — most often speaking for Westboro. In the fall of 2013, even they were replaced by a church member not related to Phelps by blood as Westboro’s chief spokesman. In Phelps’ later years, the protests themselves were largely ignored or led to counter-demonstrations that easily shouted down Westboro’s message. A motorcycle group known as the Patriot Guard arose to shield mourners at military funerals from Westboro’s notorious signs. At the University of Missouri in 2014, hundreds of students gathered to surround the handful of church members who traveled to the campus after football player Michael Sam came out as gay. Phelps’ final weeks were shrouded in mystery. A long-estranged son, Nate Phelps, said his father had been voted out of the congregation in the summer of 2013 “after some sort of falling out,” but the church refused to discuss the matter. Westboro’s spokesman would only obliquely acknowledge this month that Phelps had been moved into a care facility because of health problems. Margie Phelps did not reveal to The Associated Press on Thursday the condition that put Phelps in hospice care. Asked if he was surrounded by family or friends at his death, she would only say that “all of his needs were met when he died.” There will be no funeral, she said. Fred Waldron Phelps was born in Meridian, Miss., on Nov. 13, 1929. He was raised a Methodist and once said he was “happy as a duck” growing up. He was an Eagle Scout, ran track and graduated from high school at age 16. Selected to attend the U.S. Military Academy, Phelps never made it to West Point. He once said he went to a Methodist revival meeting and felt the calling to preach. Ordained a Baptist minister in 1947, he met his wife after he delivered a sermon in Arizona and they were married in 1952. Phelps was a missionary and pastor in the western United States and Canada before settling in Topeka in 1955 and founding his church. He earned his law degree from Washburn University in Topeka in 1964, focused on civil rights issues. But in 1979, the Kansas Supreme Court stripped him of his license to practice in state courts, concluding he’d made false statements in court documents and “showed little regard” for professional ethics. He called the court corrupt and insisted he saw its action as a badge of honor. He later agreed to stop practicing in federal court, too. Westboro remained a small church throughout his life, with less than 100 members, most related to the patriarch or one of his 13 children by blood or marriage. Its website says people are free to visit weekly services to get more information, though the congregation can vote at any time to remove a member who they decide is no longer a recipient of God’s grace. The church’s building in central Topeka is surrounded by a wooden fence, and family members are neighbors, their yards enclosed by the same style of fence in a manner that suggests a sealed-off compound. Most of his children were unflinchingly loyal, with some following their father into law. While some estranged family members reported experiencing severe beatings and verbal abuse as children, the children who defended their father said his discipline was in line with biblical standards and never rose to the level of abuse. “Anybody who’s going to be preaching the Bible has got to be preaching the same way I’m preaching,” he said in 2006. Despite his avowedly conservative views on social issues, and the early stirrings of the clout Christian evangelicals would enjoy within the Kansas Republican Party, Phelps ran as a Democrat during his brief dabble with politics. He finished a distant third in the 1990 gubernatorial primary, and later ran unsuccessfully for the U.S. Senate and Topeka mayor. 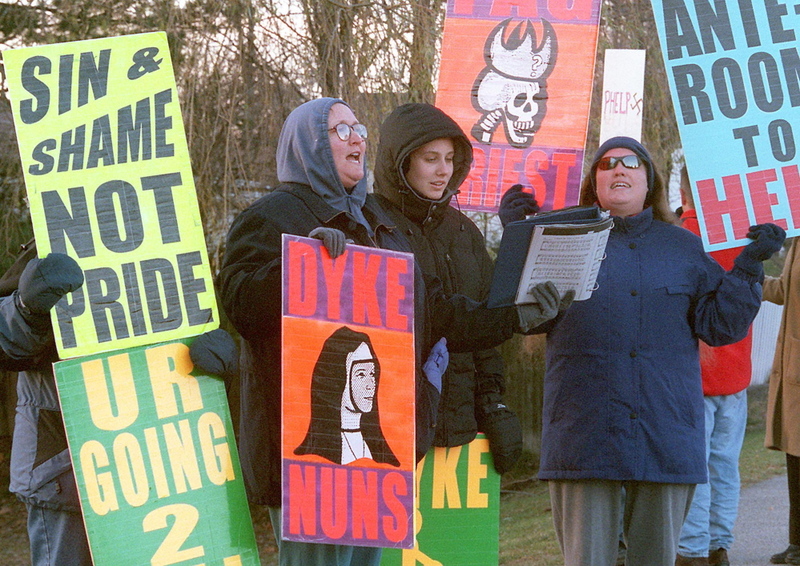 It was about that time that Westboro’s public crusade against homosexuality began. The protests soon widened and came to include funerals of AIDS victims and any other event that would draw a large crowd, from concerts of country singer Vince Gill to the Academy Awards. He reserved special scorn for conservative ministers who preached that homosexuality was a sin but that God nevertheless loved gays and lesbians. When the Rev. Jerry Falwell died in 2007, Westboro members protested at his funeral with the same sorts of signs they held up outside services a decade earlier for Matthew Shepard, a gay University of Wyoming student who was beaten to death in 1998. “They’re all going to hell,” Phelps said in a 2005 interview of Christians who refuse to condemn gay people as he did. It wasn’t just the message, but also the mocking tone that many found to be deliberately cruel. Led by Phelps, church members thanked God for roadside explosive devices and prayed for thousands more casualties, calling the deaths of military personnel killed in the Middle East a divine punishment for a nation it believed was doomed by its tolerance for gay people.